UGC Regulations require all (continuing & new) students to submit an online Anti-Ragging Affidavit at the beginning of every academic year. This is a mandatory requirement and SSO requests full support of all students towards the same. Please read the instructions given below very carefully before filling the Affidavit. If you have any questions, please contact us at Student Services Office. 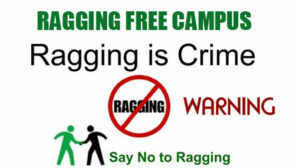 Please read carefully the Summary of the UGC Regulations and the Supreme Court Judgment on anti-ragging. Once you have read these documents, you must go to the website: http://antiragging.in/ click on the tab that says “Online Undertaking (Affidavit)”. Please fill up the affidavit with correct and latest information. After filling the form, you will receive the Student’s Anti Ragging Affidavit and the Parents Anti Ragging Affidavit in your e-mail. Print both the Affidavits, sign them yourself, and request your parents to sign their Affidavit. You are requested to upload your signed affidavits at SSO – Anti-Ragging Data link, and submit it. Name Designation & Department E-mail ID Contact no.